Communities come together for various reasons: a devastating event, to raise money and a call for change. My idea for KwanzaaCulinarians.com honestly started when learning about a popular food show host demonstrating a Kwanzaa cake. It’s obnoxiously funny and insulting at the same time. However, it inspired a question: Are there any Kwanzaa recipes? Kwanzaa is about supporting and celebrating the African Diaspora. Everyone of African descent has a recipe representing his or her country, culture, language, religion, community, tribe and family. And, we should celebrate and honor our diverse heritage, in a respectable tradition. Such question was answered with an idea. The idea became a reality when Chrystal of DuoDishes.com agreed to help. It became dynamic when Bren of FlanboyantEats.com jumped into our project. Courtney of Coco-Cooks.com initially helped, but when her additional projects became too busy, Shelley of EatRelateLove.com stepped in to take over. Last—and, definitely not least—Lisa of AnalisFirstAmendment.blogspot.com took over my group, making it easier for me to focus on content from December 1st to the 25th. 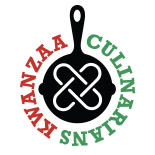 With the six of us, we reached out to other food bloggers of the African Diaspora to share their food stories and recipes within our idea, KwanzaaCulinarians.com. Throughout this process, we balanced personal family emergencies, external projects and businesses related to our personal food blogs, and our careers. It wasn’t easy, yet with patience and trust we worked as a community to develop KwanzaaCulinarians.com. However, when I was hit with a personal family emergency that suddenly required me to fly out of town—I was beyond shocked. It was a phone call on Saturday, but I didn’t think much about it. I told myself, “…No worries… it’ll all work out…focus on getting these projects out on time.” Sunday’s news brought dark clouds of more worry. Still I hoped and worked through my nervousness. My boyfriend–who always prepares for the worst–started making phone calls about plane tickets. I woke up Monday morning with the phone call that ended all hope. I was numbed and shocked into disbelief. This is where my neighborhood community stepped in to hold me together. My boyfriend called a friend who had access to a buddy pass. Such a friend made all the plane arrangements for leaving and returning to New York—I didn’t have to spend hours looking for plane tickets. When I told KwanzaaCulinarians.com about my family emergency, they all stepped in to manage and promote the site in my sudden absence. They did it flawlessly. My tasks for my personal food blog and KwanzaaCulinarians.com were finished three hours before my flight was scheduled to leave New York City. Monday morning’s news had completely shocked my mind and in the midst of the chaos, I was eerily calm and moving with slow disbelief. My boyfriend frantically moved around the apartment, afraid I was going to miss my flight. He gave me one of his suitcases since I hadn’t had the time to pack. We rushed into the airport. He kissed my forehead to tell me to move quickly. I continued moving in disbelief. Since, Saturday afternoon, I hadn’t really slept. After my bags were checked in, the airline motioned me towards the longest security line. My flight was leaving in 40 minutes. Out of concern, the boyfriend had returned to check in on me. He saw the length of the line and yelled at me to jump to the front because of a family emergency. I suddenly woke up to the reality of what was happening. When people learned of my situation, they immediately rushed me to the front of the line. Security made sure I was the first one through the screening process. I ran through the airport—minutes before the door to the plane was to close. This was a community of unknown strangers who understood my circumstances: I was traveling to California for a funeral. This was also the first time I was seeing family since High School and meeting new family members. Older family members know me very well, but since I live far away, reintroductions are awkward moments. The last memory of our previous visit had faded. Walking around my Grandmother’s grand house that sits on top of a big hill, childhood memories suddenly reappeared. There was Grandmother cooking collard greens from her lush garden in the backyard and frying hot-water cornbread in her black skillet, my cousins and I rolling down the hill alongside a driveway lined with peach trees, Siamese kittens playing in our hair, the yellow long Cadillac with doors so high we only saw the tops of trees and buildings in a blur as we sat in the comfort of leather backseats on the way to church, devouring tacos with too much hot sauce, eating crates of fresh cherries, going to the beach to find iridescent abalone seashells,and my Aunt’s grand excitement as she predicted our futures in the middle of Grandmother’s yellow kitchen. This time I arrived in the shadow of those memories, in my adulthood of reality. In our despair, Mom, my sister and I would walk around the neighborhood. I loved the neighbors’ orange and lemon trees. A rooster was heard in a distance, which signaled fresh chicken eggs. As a foodie, I wanted to take a few citrus fruits and find out where the rooster lived. Mom cautioned me about not being in a friendly neighborhood. However, the citrus in the grocery stores were amazingly sweet. It’s currently citrus season in California. This is the time when California and Florida ships their seasonal meyer lemons, Cara Cara Oranges, pomelos, key limes, blood oranges, mineolas and tangerines into New York (it explains why people give crates of citrus fruit to each other as gifts at this time of year). A week later, I returned to New York City to continue working on KwanzaaCulinarians.com and MyLifeRunsOnFood.com. My recipe, Orange Palm Sugar Cake, is inspired by my experience of working with everyone and a sudden trip to California made possible by loved ones. Creating KwanzaaCulinarians.com has been a beautiful experience of connecting to a community of passionate foodies, in which we support each other. From a silly food show, a positive idea was started, and it was made possible by food bloggers around the country who believed in the same idea. In addition, we all wanted to learn more about Kwanzaa. In my own personal need of help, it was my neighbors, friends, family and my boyfriend who pushed me to continue on in my disbelief and shock. Lastly, it was my dear Aunt who gallantly predicted I would be a publisher. As my cousin said at her funeral, she always had a way of making people feel good about them selves. It was my Aunt who always believed in me. Within this new online technology, we published KwanzaaCulinarians.com. The experience of working on this project is truly out of effortless love. Within this project, I’m inspired to fiercely pursue a publishing career starting as an Online Managing Content Editor (or any starting position). Thanks to the Internet, dreams are easy to achieve. I’ve talked with several contributors involved with KwanzaaCulinarians.com, and they’ve also told me the realization of their dreams of being in the culinary industry, too. To truly understand what Umoja means to us, we built this community through a passion of food. It’s up to us to determine our future. 1. Preheat oven to 350°F with rack placed in middle. Line the bottom of a bundt pan (if has a flat bottom) with wax paper. Butter the bundt pan with lots of butter and dust with flour or palm sugar. 2. Whisk together flour, nutmeg, baking powder, baking soda, and salt. 3. Beat together butter and palm sugar in a mixer at medium speed, scraping side of bowl occasionally, until golden and fluffy, about 4 to 5 minutes. 4. Add eggs one at a time, beating well after each addition. Add vanilla, orange zest and juice until combined just well. 5. At a low speed, add a third of the flour mixture to the butter. Add half the milk. Continue alternating to end with the flour mixture. Occasionally scrape the sides. Mix until the ingredients are just combined. Do not over mix. 6. Gently place batter into the buttered bundt pan. Use a spatula to smooth the top. 7. Bake in the oven for about one hour or until a wooden toothpick inserted into center of cake comes out clean (a very tiny amount of crumbs are okay). 8. Cool in the bundt pan for one hour. Then invert the cake on a wire rack to completely cool. It remarkable what you have pulled together. I’m so sorry to hear about your aunt. You’re such an inspiration Sanura!This post is beautiful. I’m so happy and proud to be part of this community. This entry was posted on December 26, 2011 by Kwanzaa Culinarians in 2011, Personal Story, Recipe, Umoja and tagged citrus, MyLifeRunsOnFood.com, Orange Palm Sugar Cake, palm sugar, travel, Umoja.